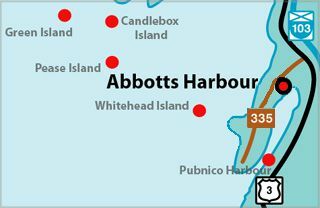 This lighthouse was built on the mainland at Abbotts Harbour in 1922, to replace the previous system of a lantern hoisted on a mast which was located on located on Abbotts Island. The lighthouse is a tapered square timber building 30 feet (9.1m) high. 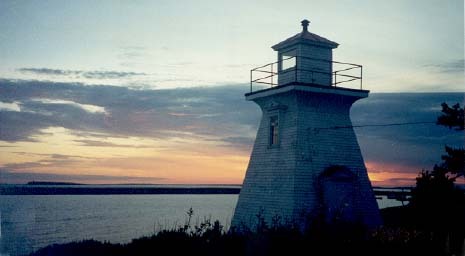 This design is typical of small harbour lighthouses. 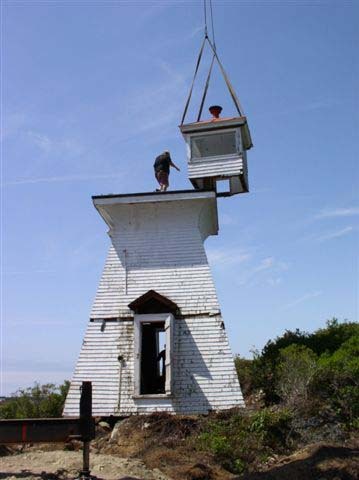 When the Department of Fisheries and Oceans sought to pass the lighthouse over to the community, they discovered that it had been built in the wrong place, on private land. A solution for this dilemma was sought. On Thursday, June 24, 2004, it was cut in three pieces and moved on a flatbed truck from Abbott's Harbour Road, Lobster Bay, to "Le Village Historique Acadien" in West Pubnico. Transfer of ownership to Le Village and moving the lighthouse is an excellent way to ensure its interpretation and continued preservation. Located by the water at "Le Village Historique Acadien" in the town of West Pubnico. Placement of the "dot" on this map will be corrected. It should be farther inland and on the other side of the peninsula. The 31-foot wooden tower began its life in Amherst, Nova Scotia, and was moved to Abbott's Harbour in 1922 to replace an earlier light on a pole. The d'Entremont family kept the light for 77 years. 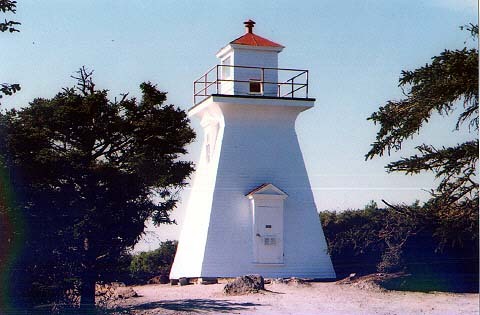 In 1990, Father Clarence d'Entremont and other members of the West Pubnico Historical Society created Lighthouse Park (Parc du Phare), with picnic tables and benches near the lighthouse. But the land was privately owned, and the present owner didn't want to be responsible for the care of the decommissioned lighthouse. 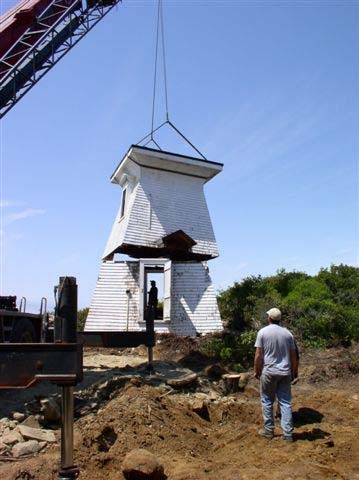 On June 24, 2004 the tower was cut into three sections and loaded onto a flatbed truck to be transported a few miles south to the museum. 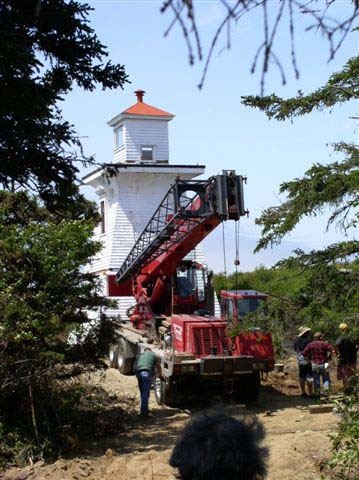 It was a surprise to some of the local residents, who had no idea the lighthouse was going to be moved. Light Height: 037ft feet above water level.